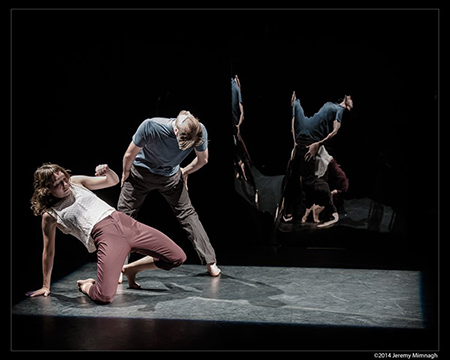 Acclaimed Toronto choreographer Heidi Strauss’s latest work elsewhere, which debuted this week at the Harbourfront Centre, is almost there. It’s right at the edge, leaning out into the dark, grasping for something that keeps slipping away. It’s this quality of peering into the shadows, dimly making out the contours of some hoped-for thing (the “it”), that defines every minute of elsewhere. The mystery that propels the performance is the elusiveness of the immediate future: that confused anticipation we experience as the very next moment of life breaks upon us and everything we’ve ever done rushes forward to show us how to respond. Strauss elicits the intelligence of human bodies and their savvy for the real world. We’re ready to act and we know what to do, even if our brains can hardly keep up. The word she uses to describe this level of her inspiration is “affect,” a term she discovered in the language of psychology and cultural anthropology. A person’s affect is the way they experience their feelings, or as Strauss defines it in her program notes, “the human capacity to register experience, even the subtle moments that pass unnoticed.” Strauss is interested in the way that those felt experiences accrue in the body, and how they are expressed in a person’s reflexive gestures and habitual movements. Our affect is constantly breaching through the surface of our lives; it’s how we welcome existence, and how we defend against it. Our pathways into the future are determined by what our bodies have learned to do, but as we gain experience, our bodies adjust, and our affect changes. This interplay creates a feedback loop, and Strauss’s choreography is meant to amplify that frequency. The choreography shows the dancers at the encounter of past and future, right at the terrifying onset of the present moment. There’s a quality of waves beating on the shore: at times the performers launch themselves up, crawling into the air on one leg, and then they collapse and sink back down. When the dancers crumble, their bodies segment and slide apart, like the layers of the earth. It’s clear that Strauss has searched very carefully in her dancers for signs of their unique affect, and encouraged them to let their natural movements suffuse the choreography. The performers in elsewhere are some of the best in the city, dancers with incredible skill and vast experience, and Strauss has made it her intention to unleash them in this show. Molly Johnson is one of the younger of the five dancers, but also one of the most distinctive. She possesses a very relatable openness that audiences can attach to; she becomes a touchstone for the piece. Danielle Baskerville is a consummate master whose movements demonstrate a clarity and essentialness that is both exciting and soothing. Brendan Wyatt is a generous, powerful presence on stage, clearly very attuned to the other dancers and a pillar for the whole performance. But the differences between the dancers—intriguing and inevitable as they are—also create strong contrasts that are cumulatively a bit jarring. Strauss’s emphasis on the individual affect threatens the coherence of the whole work. It’s hard to connect Baskerville’s deeply grounded style, for instance, to the looseness and freneticism that some of the other dancers express. There’s very little narrative with which to make sense of such variations, so the dancers can sometimes feel isolated among each other. elsewhere never abandons the tension that drives it forward. It’s an unrelenting work, and it left me at the end with that same anxious sense that something is missing, just out of sight. The affect of this performance isn’t fear, however, but courage. Whatever’s coming, whatever’s out there, Strauss shows only one option: press into it. Keep looking. elsewhere is playing at Harbourfront Centre Theatre (231 Queens Quay West) until Sept 27. Ticket prices range from $19-$37 and can be purchased in advance here. Photo of Molly Johnson and Luke Garwood by Jeremy Mimnagh.